This whole website investing journey began over a year ago with my parents becoming interested in using websites as an alternative investment vehicle. They were kind enough to trust me with thousands of their own dollars to go out and buy a website of my choosing. This began my search for a website and within a matter of weeks, I was able to find the perfect website for $6,000. The deal I had with my parents was that they would put up the initial $6,000 to buy the website and then we would split the monthly profits 50/50. Then when/if we decide to sell they would get their initial investment of $6,000 back first and then we’d split the remaining profit 50/50. I can’t believe that it’s already been a year since we bought this website! Before we get into this new update I just want shoutout my parents for trusting me with their money and having faith that I would be able to put their $6k to good use. Let’s dig right in and take a look at the most important stats from the past 12 months. As this graph shows, the site’s monthly revenue has been improving month after month. To give you an idea of the monthly improvements, let’s look at the average monthly revenue from the first 6 months that we owned the site compared to the most recent 6 months. You might be wondering why I chose to look at revenue instead of profit first, good question! The reason is because revenue is the best metric to show the true growth of a website. There are exceptions to this, such as if you were using paid advertising and ignoring the costs of runnings ads and only looking at revenue. Then revenue would not be an accurate representation of growth. However, in my situation where the only expenses are from new content and buying products, it makes sense. With all of that being said, we can’t ignore profit as it’s the most important overall metric for any website so let’s look at that now. 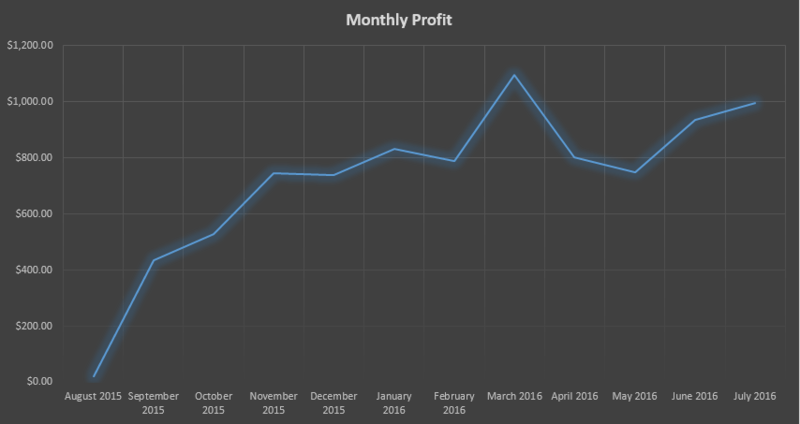 The graph of the monthly profit follows the same trend as the revenue graph, which is a solid upward trend. In the same way we compared the average of the first 6 months to the average of the last 6 months with the revenue, let’s do the same for the profit. A solid ~$350 increase in the average monthly profit, not bad. Although not as drastic as the revenue/profit growth, the traffic has grown fairly well since I took over as the owner. The large spike you see is from a Facebook post going viral and driving 30,000+ visitors during that month. Aside from that large surge, the traffic remains fairly consistent month in and month out. Pinterest remains the major driver behind the site’s traffic despite my best efforts to grow the organic and Facebook traffic. I’m not too worried about the bulk of the traffic coming from Pinterest as much as I was when we first bought the site because I have learned that Pinterest is a very high-quality traffic stream. I have explained this before, but Pinterest is great because the traffic is not “one-time” type of traffic like Facebook and Twitter is. Instead, it acts more of a “search engine” than anything else. I major reason for this growth is due to consistent posting every day. That along with posting high-quality content is the key to doing well on Pinterest. It’s also worth mentioning that the niche of my site is perfect for Pinterest as well, which has a lot to do with the success. I can’t stress how important it is to find the community where your audience hangs out and then become an authority within that community. That’s the quickest way to gain momentum within any niche. Sticking with Pinterest, let’s look at the growth of the overall account. When I first took over ownership of the site and the Pinterest account it had 2,777 followers. The account has grown by more than 18,000 followers! That’s some awesome growth. I’ll be looking to continue doing what already works, but I am also interested in starting to test some different strategies out and see how it pans out. Facebook has been very inconsistent, but it has slowly started to drive more and more traffic. The first few months that I owned the site I didn’t utilize Facebook at all as I was mainly focused on Pinterest at the time. However, over the past 6+ months it has become a major focus and it looks to be paying off so far. The large spike you see is from a post that went viral and drove over 33,000 visitors in a very short period of time. This was awesome, however, the traffic eventually died down. Since the large spike in March, the traffic has been seeing some growth compared to the months before the spike. This is largely due to being consistent and posting 2 two times every single day. It’s hard to tell from the graph as the large spike skews the graph so badly, so let’s look at the numbers themselves and compare the last 4 months since the spike vs the 4 months before the large spike. I am not counting the large spike in this calculation because I am more concerned with organic growth and not “viral posts”. This is a good representation of the growth of the Facebook traffic in the last few months. Although I have nearly 6x’d the FB traffic, I still feel like I’m only scratching the surface and will be looking to continue to grow the traffic from here. A decent 1,700+ visitors per month growth. I’ll be looking to grow this even more over the coming months. Selling physical products has been a minor focus the last few months but I’ll be looking to ramp things up. I will talk more about my future plans a little bit further down in the article, but I will be attempting to make this a large part of the site’s revenue. Right now, the bulk of the traffic is coming directly from the main site. There is a link in the navigation menu called “Store” which directs them straight to the store. That is the main source of traffic right now, aside from a few referral visitors from Pinterest. The reason why I haven’t pushed the store harder on the main site yet is because I only had a handful of products and they weren’t very good. Two sales were made. Not fantastic, but it is a good sign that there’s some potential here. Also, I made 5 sales in the month of August (not in this report) which is promising. Keep in mind that the product pictures were taken from my iPhone, the product descriptions were put together in 15 minutes and the only true promotion has been one link from my main site. I’ll be spending more time optimizing my store because I feel like it could be a new source of untapped revenue that could add to the bottom line of the site. I’ll talk more about my plans to grow this in a minute! A few months back my parents and I were seriously considering selling the site, but we decided to hold onto the site and it has only grown in value since then. As a refresher, the common way to determine the value of a site is to use the last 3 months average net profit and multiply that by a multiple based on various factors. First, let’s get the last 3 months average net profit. A very solid ~$900/month in profit the last 3 months. Now that we have the L3M average, we now have to determine the multiple. Like I mentioned earlier, the multiple is determined by a variety of factors such growth, owner time involvement, and most importantly profit. Based on those factors am going to assume a 25x monthly multiple, which is a very common multiple for this type of site. As of right now, the site is approximately worth $22,349 if we were to sell it based on the numbers through July 2016. When you remember that we bought the site for $6,000 12 months ago you can get a taste of the type of returns websites can provide if you know what you are doing. Let’s take a look at the site value over time. The green line shows the value of the site based on the last 3 months average net profit multiplied by a multiple of 25x. The blue line represents the purchase price of $6,000. 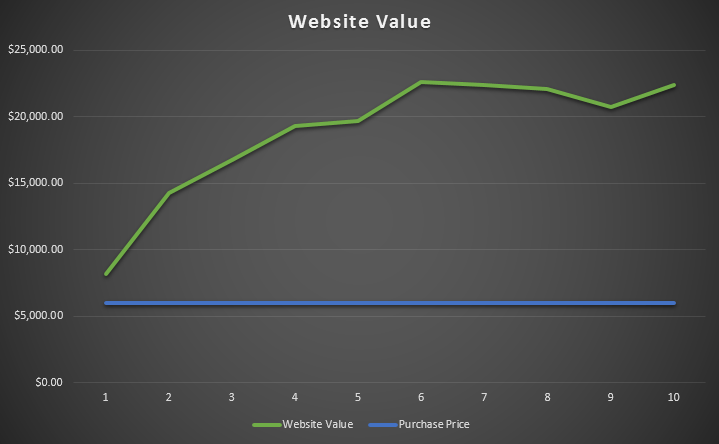 As the graph shows, the value of the site is way above the price we paid for it. It also shows that the value of the site grew quickly in the first 6 or so months and has remained fairly steady the last few months remaining above the $20k range. All of the other stuff we have talked about so far is cool, but this section is the most important. My parents invested their hard earned money into this site and they expect their return on their investment just like any investor would. For that reason, the ROI is a metric that I keep in mind for any decision that is made. Let’s take a look at the ROI for my parents $6,000 investment 12 months ago. Keep in mind that my parents and I have a deal where we split the monthly profits 50/50 and then when we sell the site they get their initial $6k investment back off the top and then we’d split the remaining profits 50/50. So in 12 months my parents are $1,500 short of making their entire initial investment back. Based on the recent months, I’d assume that in 3 months that they will have made their entire $6k back. Once that happens it will be all profit from there on. We have to remember that this is SOLELY from the monthly cash flow of the site and isn’t accounting for the current value of the site. Just like real estate, the largest payout comes once you sell the asset itself. The fact that we have almost made our initial investment back within 12 months solely from the monthly cash flow is very good. Next, I want to look at the ROI if we were to sell the site right now. We will use the estimated site value which we calculated above. If we were to sell the site my parents would have made over $12.5k in profit on their initial $6k investment 12 months ago. That’s a real solid ROI! However, as you’ll see we are not planning on selling right now and I’ll continue to grow the site even more. As I just mentioned, we aren’t planning to sell the site anytime soon and I’ll keep trying to grow the site. I have some growth plans in place that I think will take the site to at least $1,500/month in profit by the time we decide to sell. Let’s dive into what the future holds for this. I think this could be a game changer for the site. I have purchased a variety of products and will be testing to see which ones are popular and then invest in more stock. I’ll also be looking into Pinterest and Facebook ads to promote my products. I think it could be a great way to systematically scale the Shopify store and grow the site’s profit. Right now, the profit margins are 80% on all products that are sold so I have some wiggle room when it comes to runnings ads and still remaining profitable. I’ll have more info regarding this in the coming weeks, but this will be a major focus for this site moving forward. I have had good success so far with Adsense, but I am interested in testing out other ad networks to see if I can further optimize the ad revenue. I have been messing around with Media.net and have been seeing some decent results, but I’ll need to test it more to get a good idea if it’s worth pursuing further. I also want to look into other ad networks such as Ezoic. I think it could be worth making the switch and this is something that I’ll be looking into. I really want to get to $1,000/month in ad revenue. I think selling the site for $30,000 is very doable and the plan is to reach this goal within the next 12 months. As of right now, the plan is to sell the site sometime next summer. To sell for $30,000 we will need to get the monthly profit to around $1,500. I think this should be fairly easy to accomplish between the Shopify store and testing new ad networks. Although this is the plan as of right now, it could change at any point. We’ll see what happens and you’ll all be here to see how it goes! I can’t believe it’s already been a year since we purchased this website! This was the first website that I purchased that would be considered “substantial”. I bought a couple super small sites for a couple of hundred dollars before this site, but nothing in the thousands of dollar range. However, in the 12 months since this purchase I have picked up 4 new sites that have all been fairly big. I really enjoy buying new sites and growing them using a variety of strategies. My plan is to keep doing this and start to get into the six figure plus sites as soon as possible. As for this site, I’ll continue to keep you in the loop with quarterly updates so you can follow along the progress of this site. Thank you all for reading and I want to give a huge shoutout to all of the people that have been reading this case study from the beginning. I hope that you have enjoyed reading each update and have been able to learn a thing or two. Before I end this article I just want to let you all know that you should expect more content coming from me soon! You can also expect a brand new update in my Website Flipping case study to come out within the next week or two. Anyone who has found this case study to be interesting will love my new one. Been waiting for this Josh, thanks for posting. Great to see this site coming along, look forward to more updates. Glad you enjoyed it Ian! And good catch on the organic search numbers, it’s fixed now. Do you plan to write a noob friendly tutorial on how to get into something like this? Your update posts seem so exciting and would like to learn how to do what your doing, but just not sure where to even start. And I must be on the right path for someone to compare me to Pat Flynn, thanks! How are you doing your pinterest pins? Are you creating new content for pinterest, or are you curating for Pinterest? Combo of both. I post new content to pinterest, repurpose old content as well as repin other content. awesome job! Could you give a tutorial on growing a Pinterest following? I have been slogging on Pinterest for a few months, following advice online, and gained few followers. Hi Sue – thanks for reading and leaving a comment! Hi Josh! Great update. My question is: Do you think you could repeat this on a newly purchased website? Do you feel your processes are repeatable? I read your reddit post what feels like a year ago and just stumbled upon your new post and site. Congrats on the success man! Personally I would love to get into this as I feel that I have a skill set that will help. I am a web developer so websites are my thing… well making them. Not all that familiar with optimizing like you, but believe I could pick some stuff up from all the knowledge bombs you are courteous enough to drop on here and other places. I’ve always been into investing and have had great returns in the stock market this year, but I LOVE active investing, which this seems perfect for what I do for a living. Thanks man! Awesome to hear Jacob! My advice would to jump right in to building websites and learn how to grow them. This is the best way to learn as you can only learn so much from observing others. Go get it my man! Can you make a post about how you generate content using upwork? such as best practices on how to find good talent and make sure that they deliver what you need? Can’t wait to see how it turns out, cheers! Congratulation Josh, nice work indeed. What tool/software do you use for your graphs? They look very pro, is it a simple excel formatting or something more? 1) What do you use for your charts? The black ones. 2) When you calculated the estimated value of the website as of now, you made x25. You bought the site 6000$ and was making around 500$ month. So technically, it was a great deal even tho you wouldn’t have increase revenues? 2. Correct, I got a really good deal on the site and even if I didn’t increase the monthly earnings I still would have made a profit when I decided to sell. When are you going to update us again? it would be great to get some updates or a new blogposts. Working on a new update now 🙂 I apologize for the delay! How much would you sell Pip for ? How you make earning graphs, which tool you are using?